Wake up. Coffee. Still trying to wake up whilst packing school lunch and bags. Maybe I need to make my coffee a little stronger. Yes, more coffee. Then I walk outside to this. Right in my front yard. My hibiscus trees all in flower. For a moment I feel like like I am in Hawaii. That is enough to lift my spirits today. Have a great day! Coffee and hibiscus...great combination. We're having to make do in Canberra with the lovely colours of autumn instead...not many pretty flowers left now. Queensland...beautiful one day, perfect the next right? These freeze during the winter in Texas. Have to buy them new every year. Your's are lovely. Well, we certainly don't have much chance of walking outside and seeing flowers like that at the moment in Melbourne. Will have to settle on some nice new cushion fabric instead perhaps? What a sweet little pick-me-up. So lovely! You must share your gardening tips with us! 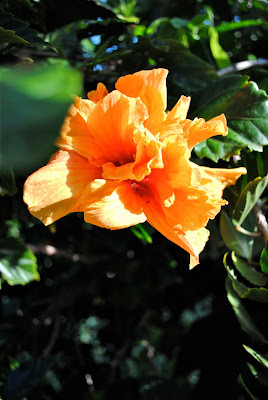 I love hibiscus and have a rainbow of them around my house! Now you just need a cup of Kona coffee to go with your Hawaiian morning. I also have a question: I am looking to buy some drift wood (thin) to put in a vase. Do you know of any good places to find it (besides the beach:) ? You captured them beautifully. Great photography! They really are beautiful, we have them in out garden too. I love the red ones...! these are such beautifl pictures. Love these colours - so tropical! Pretty flower shots! 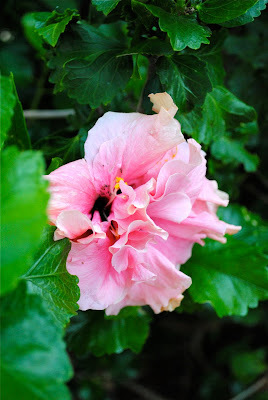 Hibiscus flowers are some of my fave! They remind me of the tropical islands. Those hibiscus' would surely be enough to rouse me as well, I'll take them over more coffee any day!! But Coffe and beautiful flowers must be a great way to start your day. Those are lovely. Everytime I see your flowers I can't wait until ours start blooming. Just stumbled upon your blog - was intrigued by the title as that is the style of my house too! sorry that should say OUR mountain lol! ps. note to self ~ always proof read blog comments before pressing buttons... doh! aloha girl! Cant grow those suckers on your mountain, too cold but sure enjoy the photos. Reminds me of our month long trip to Queensland the summer just gone ~ bliss! Such gorgeous flowers, Have a sweet day! Such beautiful flowers, what a perfect thing to wake up to!